Mallorca is truly the cycling isle. Offering jaw dropping and astounding views across the Tramuntana mountain range, experienced cyclists will climb and descend the hallowed tarmac of Sa Calobra, Puig Major and Cap Formentor. From Port Pollensa, the Tramuntana’s formidable limestone spires offer the ultimate cycling holiday. For those looking to immerse themselves in the rural flatlands, you can ride through almond blossoms falling on the meadows, through sleepy villages peppered with orange groves, whilst spending your nights staying in fincas (converted barn houses and traditional stone buildings). You can travel to Mallorca with confidence that the weather will be sunny for the majority of the year. Autumn and Spring are the most popular seasons as the temperature is cool but the sun is still present however, you will still find excellent riding in the summer and winter so long as you have weather dependant clothing and equipment with you. From Mallorca’s turquoise coastlines to its famous climbs, this stunning Balearic island never fails to seduce. Sa Calobra. The winding climb in the north west of the island. Mallorca's rural landscape is full of windmills and blossoms. Just some of the islands features that make it so beautiful. Valdemossa, a charming town inland from the Mallorcan west coast. One of the many unique places to stop on the island. 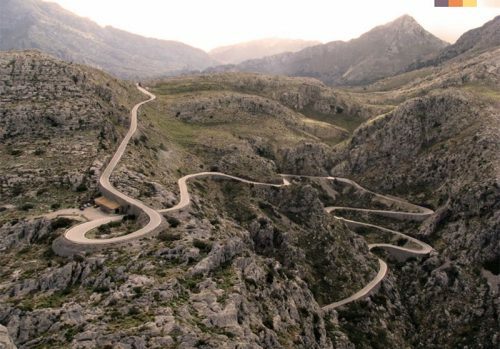 Mallorca is one of the most famous places for great climbs and pristine roads. Cycling here is a true joy. Mallorca is the perfect cycling destination for families, seasoned riders, newcomers and everyone in between. The famous mountains in the north offer a challenge for families with experienced riders whilst the south coast provides flatter routes and is made up of peaceful countryside, beautiful coastal roads and unexplored beaches. For adventurous, cycling mad families, we recommend going on our Port Pollensa Cycling Holiday. From here you can tackle the mountains and race your family members up the ascents. However, if you’re looking for a relaxing cycling holiday with sun and beaches then the south of Mallorca is perfectly suited to you. Our Southern Beaches of Mallorca trip guides you through quiet finca towns, beautiful coastal cycling paths and with fully flexible routes, you can choose how much or little you want to cycle depending on the requirements of each family member. One of the best places to cycle on a budget is Mallorca. We offer great package deals on our Mallorca Cycling Holidays, helping to save you as much money as possible on your trip. We will include accommodation, airport transfers, luggage transfers, great bike hire and more on our holidays and, with our various contacts in Mallorca, you can be confident that the hassle free booking process will be significantly cheaper than if you were to make booking the holiday yourself. Our favourite low budget cycling holidays in Mallorca are the Sa Calobra & Soller Cycling Holiday and the Cycling Break from Palma. These trips start at £245 and £155 respectively which is cheaper than you will find anywhere else. Within these packages, we will provide you with the best routes in the area that fit your requirements for average cycling distance each day and average amount of climbing. We will then tailor the rest of the holiday to fir your budget, including the quality of accommodation, use of transfers, bike hire and more. Whilst we do offer low budget trips, we love staying in Mallorca for a long time as there's just so much to do! We want to create the best all round experience for you which, although might be a bit mnore expensive, will be worth the extra price. Just let us know what you're looking for and we'll make sure you enjoy an incredible holiday in the Balearic Islands. If you’re an experienced rider looking for one of the best cycling holiday destinations in the world then you’ve come to the right place in Mallorca. The island is known famously for its incredible mountains and awe-inspiring coastal routes. As our most popular destination for experienced cyclists, we have a lot of knowledge of the island and pride ourselves in our ability to create the best overall holiday for you. For experienced riders who wanting to ride an organised, large scale event, the Mallorca 312 weekend is very popular and provides riders with incredible views of the west coast and the Tramuntana mountain range, climbing the famous Coll Puig Major and the Grau de Superna. The 4 day Mallorca 312 all inclusive package includes your accommodation, transfers, meals, race entry and more. If you’re interested in this sportive don’t hesitate to give us a call on 0207 157 1519. If you’d prefer to explore Mallorca on your own, we recommend our Sa Calobra & Soller Cycling Holiday or one of the fully flexible Mallorca Training Camps. The former is based on staying within the Tramuntana mountain range. you can travel for as long as you want and we will provide you with the best routes to tackle the mountains during your stay. Our Mallorca training camps are very popular for experienced groups or solo riders. You will choose your groups depending on the average speed you wish to ride at, then an experienced guide will take you round the remarkable island. The Tramuntana Mountain Range, that descends down the west coast of Mallorca, is home to some of the most famous climbs in Europe. Sa Calobra is certainly one of the highlights of the island. Sitting at 682 metres, the Cat 1 climb runs for 9.2km with an average gradient of 7%. It's a great challenge for experienced riders and offers magnificent views over the Balearic Sea. For a more challenging climb, Puig Major sits at 850m and demands a 14km climb at a 6.2% gradient. Both of these ascents will be on your bucket list if you're an experienced cyclist and make up just two of the many climbing highlights in Mallorca. On our Port Pollensa Cycling Holiday you can take on these two climbs as well as every other iconic ascent in the region. We'll set you up in an ideally located accommodation and provide you with the best routes to take on the mountainous island. So far we have covered the best cycling holidays for families and seasoned riders. However, if you’re travelling with a group of friends that don’t not want to ride the long routes round the island, we have also got plenty of options for them. As mentioned, you can tailor any of our Mallorca cycling holidays so if you like the look of one of our trips, just let us know and we can adapt it to suit your requirements. If you and your friends are looking for a relaxing cycling holiday in Mallorca, our Boutique Mallorca Cycling Holiday will provide you with the best accommodation and most highly recommended routes, ensuring you get the best mix of cycling and relaxation on your trip. You will be able to spend quality time with your friends and, due to the beauty of the island and the luxuriousness of the accommodation, each member of your group can choose how much cycling they want to do whilst the others chill out on the Mallorcan coast and relax in the boutique hotels and fincas. There is no where we don't like staying in Mallorca. Our cycling team have spend countless holidays in Mallorca, finding out where the best places to ride, to stay and to climb are. We know the island very well and, as such, wouldn't want to limit you! If you're struggling to decide where to stay then base your trip around the kind of riding you are hoping to achieve. For challenging, rewarding and scenic routes, stay in the north west and ride around the Tramuntana Mountain Range on our Port Polensa Cycling Holiday, our Sa Calobra Cycling Trip, any of our Guided Rides or Training Camps. For a more relaxed, family centred trip, the Coast to Coast Holiday introduces you to the varying landscapes of Mallorca via some easier rides whilst the Southern Beaches are arguably one of the most beautiful spots on the island. There's truly something for everyone making choosing our favourite destination almost impossible (we do love the rides downs the west coast, through)! The Cap Formentor Lighthouse Ride is one of the most scenic routes in Mallorca, if not the whole of Europe. The 40km ride winds between impressive mountains and quiet forests as you’re treated to outstanding views over the Balearic Sea. You’ll see the lighthouse on the edge of the island and enjoy the meandering ride up to its peak where there are even more breathtaking views to enjoy. This is where you can capture the incredible picture. Often people say ‘its all about the journey, not the destination’. In this case, its all about the journey and the destination. You can visit this iconic location on our Port Pollensa Cycling Holiday. This will without doubt be one of the highlights of your trip to Mallorca. Please share your pictures of the whole island with us by sending them to Love Velo’s Twitter, Instagram or Facebook – we love seeing people enjoying Mallorca on two wheels! Why Travel to Mallorca with Love Velo? No one knows Mallorca as well as Love Velo. Our team have ridden there many times and know the island like the back of our hands! As a result, we know the best places to stay and the best rides to take meaning we can transfer all this information to you and guarantee you have the best cycling holiday in Mallorca possible. We will organise your bike hire, accommodation, transfers, meals and more so you can relax and enjoy the island. With our British Cycling and group booking (8+ people) discounts, we will make sure your trip is the best value for money. If you're interested in travelling to this cycling haven, please give us a call on 0207 157 1519 or email info@lovevelo.co.uk and we'll sort out the best trip for you. But don't just take our word for it, here's a recent review of a trip to Mallorca with us.